On the sandbar, Null tells his enemies that he intends to destroy both the Earth of the present and the Earth of the future. Not one to listen to trash talk, Slash leaps into action ahead of the gang and the all-out brawl begins. Going head to head with Waster, Slash rips out the robot’s tongue and slices off its arm. As Leo and Don deal with Fist, future-Don finds a ditch for Candy and himself to take cover in. Taking a moment to gather his thoughts, future-Don considers how the time stream has changed and the events that led to this battle. He takes a moment too long, however, and Fist nails him with a punch. Fist prepares to kill Candy, when Leo and Don intervene. Candy makes a break for it, only to run into… Mondo? Brought to tears at the sight of him, Candy runs to her boyfriend’s arms. Mondo reveals that he’s not the genuine article, though, and makes Candy look deep into his eyes. What Candy sees are the Mutanimals, burning in excruciating torment in the fiery pits of Hell. Candy summarily faints and “Mondo” reveals himself to be Null. Mocking how women can’t handle the ole “souls of loved ones in Hell” routine, he lifts Candy up and tells Scul and Bean to call in their escape ship. As the ship lands, Bean attempts to make cover with one of his bombs, but Leo knocks it away with a shuriken. Null and the Malignoids still manage to make it to the ship with Candy and they fly off into space. In the fury of battle, Slash takes on all four Gang members by himself, trouncing Fist and shredding Waster into pieces. Fist and Lynch reveal that they’re Thanosoids, cybernetic organisms made with state of the art polyzerkonium circuitry. 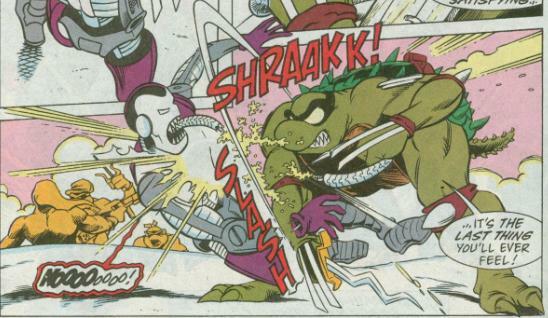 Realizing that they’re just “fancy robots”, the Turtles cut loose. Leo and Raph decapitate and kill Fist while Ninjara crushes Dead-Eye’s head with a rock. 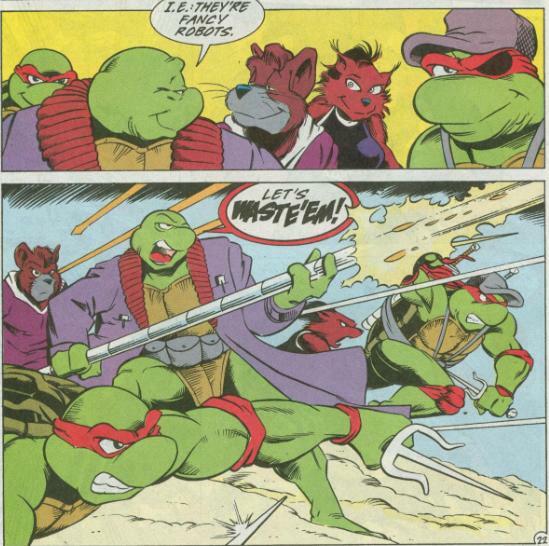 Lynch is the only one left standing, at least until future-Raph cuts off all his limbs. Future-Raph tells him to spill Null’s location in exchange for his life. Lynch reveals that Null has retreated to the dark side of the Moon. Future-Raph then kills Lynch without remorse. As everyone boards the Strato-Ray to rescue Candy and stop Null, Leo and Don ask to be dropped off in the water outside the USCGS Dator so that they can rescue Mikey from the Coast Guard. 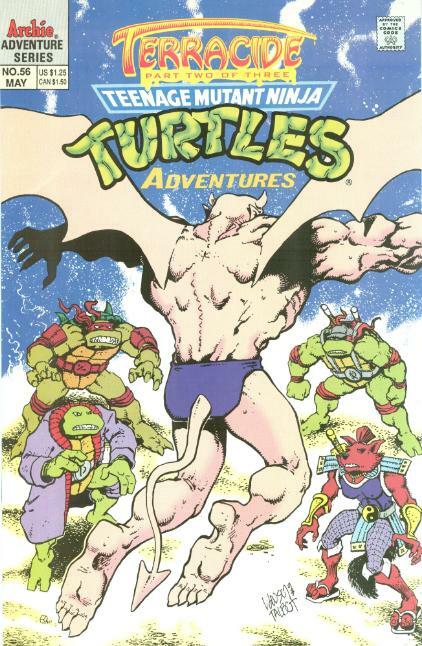 *This story is continued from TMNT Adventures #55. The story continues in TMNT Adventures #57. *A pin-up page by Mike Kazaleh published in TMNT Adventures #61 illustrates (humorously) that the Mutanimals did not, in fact, go to Hell after they died. Despite having “chapter” marks, this entire issue is just one long fight scene (and only one chapter). And while that sounds shallow, like nothing but action-oriented filler to keep the plot from progressing, the issue-long brawl is one of absolutely brutal intensity. The Gang of Four just being “fancy robots” allows for a certain level of violence the book wouldn’t have been allowed to get away with; sort of like how all the bad guys on “Samurai Jack” turned out to be robots when cut open despite all appearances to the contrary. So far as I’m concerned, I actually prefer that kid-oriented Turtle cartoons and comics use robots over human enemies, at least when it comes to cannon fodder, as it allows the TMNT to actually use their weapons. I loved the 4Kids cartoon, don’t get me wrong, but I can only suffer through Leo never ever using his swords to cut anybody for so long. There are a pair of two-page spreads in this issue, but they’re strategically executed and, again, don’t rub off like they’re “killing time” to make the issue go by faster. The first is the set-up for the brawl; the ole “both sides charge toward each other” shtick. It’s well-drawn and built up to and I love the exchange between Ninjara and Dead-Eye (“To the Death!” “No prob.”). The other spread is, well, wow. The pin-up style spread of the Mutanimals burning in Hell, done with heavy inks and a single shade of blood red. It is incredibly effective and, if you were attached to the Mutanimals, an absolutely brutal dose of salt to the wound. I complained about Talbot’s inking from the flashback in last issue, but his inking was perfect for this spread; dark, nasty and positively horrific. Murphy (Clarrain) has mentioned that he was let go by Archie’s editor Victor Gorelick because he was taking the book “too far”. Not that I agree with Gorelick’s decision (cuz I don’t), but I can totally see how the publishers at a children’s comic company could find this sort of thing very disturbing. I think my only complaint is that pages 9 through 11 are a recap of the previous few issues and I really don’t think we needed it. Last issue contained a recap of the previous batch of issues and, outside of explaining the obvious fact that future-Leo leant future-Raph his swords, it doesn’t tell us anything new about the situation. I can understand wanting to get everybody up to speed, but we just sat through the exact same info dump an issue ago. Also, Leatherhead is conspicuously absent from that “in Hell” two-page spread. Not a big deal, but I guess Allan couldn’t fit him in. All in all, this middle section of “Terracide” was all action, but it was some very intense and startling action. The Gang of Four weren’t particularly good villains and I’m glad to see them dead. At the very least, they gave Slash ample opportunity to be awesome. Yeah, that "souls of loved ones burning in Hell" really made me do a double take back in the day. I'm sure you already know my religious convictions, but I can actually remember my 11-year-old self theorizing why Leatherhead didn't show up in that page of the damned. I thought "Maybe Jess Harley came to know Jesus?" Anyhoo, this issue really did have some awesome battles. I think it may have been one of Chris Allan's finest exhibitions of his talents. 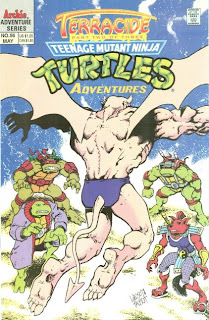 First time visiting your blog, but I thought you might appreciate that I found this by searching for "TMNT Archie Null Horsemen." He was by far the best villain in the series but I unfortunately never got to read past the deaths of the Mutanimals. Thanks for the summaries up to this point! Null tells his enemies that he intends to destroy both the Earth of the present and the Earth of the future. Wait, wouldn't destroying present-Earth necessarily destroy future-Earth? Man, I agree on Null being such a great, under-appreciated villain. Like the needless cruelty to women. This arc is pretty intense.